Granada is the most wonderful destination steeped in history and culture offering lots of opportunities for exploration and discovery… tell that to a child and I suspect that they will switch off immediately. 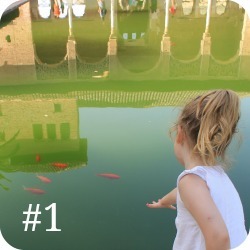 So, don’t tell them that, just pack them up with some snacks and sun cream and take them to some of places on our list of great places to take your kids in Granada. With palaces and gardens to explore and towers to climb this can be a fascinating place for kids to while away a few hours. Children under 12 can enter for free, although they will still need a ticket. You can help to bring it to life for them by genning up on some of the history together before you go. It is surprising how much more interesting a place becomes if you can imagine notorious characters of the past living there. Did you know that Catherine of Aragon was brought up in the Alhambra until she went to England where she eventually married Henry VIII? The key is to take the whole experience at their speed and don’t expect to cover everything. By even the most seasoned traveller’s standards this monument is extensive, so, if you want to make it easier on yourself and the kids and avoid a lot of queuing in the heat consider booking a guided Alhambra tour which will take you straight to the front of the line. Granada’s Science park is a great place to take the family on any day but it is a particularly good way to spend some time if the weather is a bit overcast. 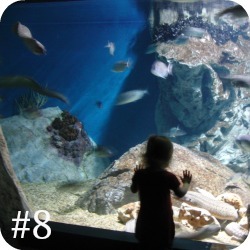 It offers great interactive fun and education for all ages. The outdoor and indoor highlights include a The Observation Tower (pictured left), Journey into the Human Body, Tropical Butterfly Garden, The Planetarium (optional extra), and The Exploration Hall for kids aged 3 to 7. Another bonus is that all information provided for each exhibit is translated into English. It is easy to reach on foot from the city centre or by bus route S5. It is also easy to locate in the car (see map below) and there is cheap parking onsite. Look for the icon on the map For a more detailed and personal account check out our blog post here. If you are looking for a place to relax in the shade, or just need some respite from sightseeing or shopping, Federico Garcia Lorca Park is a good place to go. 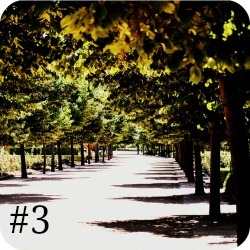 It is the largest park in Granada and there you will find tree-lined paths, rose gardens, fountains, a fantastic kids park with activities for all age groups, and duck pond. You could take a picnic or get something to eat or drink at one of the kiosks and let the kids run free for a little while. You can also visit La Huerta de San Vincente, the summer residence of Federico Garcia Lorca’s family, now a museum, where he wrote some of his best-known works. What better way to make a big city more accessible for small feet than to take a spin on the Granada Hop-on Hop-off Train. There are two routes to choose from. During the day you can take the Alhambra Route Alhambra and at night there is the City Centre Route which offers the easiest way to get to Sacromonte Abbey and the Arab baths. You can pick a one or two day pass and hop on and off as many times as you like. The train passes all the city highlights including Granada’s Cathedral, Mirador San Nicolás which offers spectacular views of the Alhambra and the city, and of course, the tapas bars and café’s of Plaza Nueva. 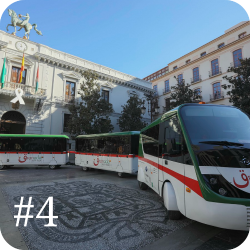 Now a common site in the city, the Hop-on Hop-off Train is a great way for families to discover Granada and includes an audioguide, available in 12 languages, plus channels in English and Spanish especially for kids. You can buy your tickets for the Granada Hop-on Hop-off Train here. Kids love the beach and that is where you will find the locals in the hot summer months. However, on sunny days the coast can be a great family destination all year round. There are some beautiful beaches to be found on the Costa Tropical which stretches from La Rábita in the East to Almuñeca in the West. You won’t find any white sand but the water quality is generally very good and beaches such as Calahonda and San Cristobal in Almuñécar offer play parks for kids as well as some great places to eat and drink. Click here for more on the best Granada beaches and how to find them. The attraction of water parks in sunny Spain hardly needs much elaboration here, and it’s not just the kids who love them. There are a couple of options open to you in Granada from June to September. 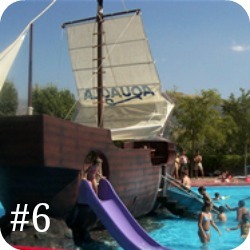 Aquaola is just outside Granada and a great option if you are based in the city with kids in need of an antidote to hot city sightseeing. You can catch the number SN1 bus to Cenes de la Vega from Puerta de Real or Paseo de Salon. The other is Aqua Tropic down on the coast in Almuñécar, the only saltwater park in Spain, and, therefore, the more environmentally friendly of the two. Both offer some great water-based fun for all ages as well as other activities and plenty of shade to relax or have a picnic. At the other end of the spectrum Granada offers great skiing and other snow sports for all the family in the winter (December to early May). Sierra Nevada Ski is Europe’s most southern ski resort so you can expect plenty of blue sky days. 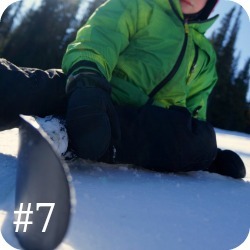 The nursery and intermediate slopes are great for beginners and kids under five ski free. They can join the ski school, which caters for all levels, or take part in a number of other activities. There is a creche for children between four months and eight years old, a dedicated snow activity area, ice rink, toboggans, ski-bike, chair-bike, mini-ski, mini- snowboard and the latest addition of a russian sled ride, which is a combined bobsled rollercoaster ride. And new for 2013/14 is the giant ski-through Whale in the new family friendly ski area. This is another good option for the odd rainy day that will appeal to kids of all ages and can be taken at whatever pace you like. As you work your way down into the aquarium’s depths you are guided through the evolution of marine life from its earliest beginnings and taken on a virtual tour of the ecosystems and species of the Mediterranean. There are a number of spots to sit and calmly watch the activity is the tanks and the visit ends in a not unimpressive walk through a Shark tunnel. For more information see the location map below or call +34 902 109 835 or visit Acuario Almuñécar. No visit to Granada would feel complete without experiencing some flamenco, after all it is said to have originated here and the tradition goes back as far as the 17th century. Flamenco is performed all over the city, but discovering a truly authentic experience can be somewhat elusive and many of the best shows are performed late at night, when children should be tucked up in bed (even by Spanish standards). The good news is that you can find family friendly flamenco (the early show starts at 18.30, but if your kids are older you might choose the second performance at 21.00) and a fabulous evening meal at Jardines de Zoraya, one of Granada’s most famous venues. The stars of the show are some of the best flamenco artists in Spain and the traditional Andalucían cuisine. You can take an early evening stroll with the kids through the historic Albayzín district to reach the restaurant where they can also enjoy the beautiful courtyard garden. This is one of the best shows in Granada so it’s wise to book in advance. You can buy tickets for Flamenco and dinner at Jardines de Zoraya here. Although strictly not located in Granada Province, but a short hop into the neighbouring province of Málaga, the Nerja caves are one of Spain’s top tourist attractions, and well worth the visit especially if you have kids who are wilting in the summer heat. Located on the outskirts of Maro, a small village 5 km from Nerja, the site comprises a series of huge beautifully lit caverns stretching for almost five kilometres and boasts the world’s largest stalagmite. Now that’s something to tell the other kids about when they get back to school! 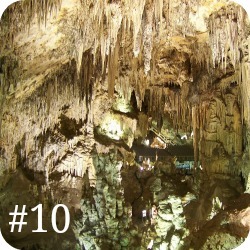 Click here for an excellent virtual tour of the caves. *Tickets to the Alhambra and the Science Park are included in the Bono Turístico Granada – Granada Card – a tourist pass which includes discounted entry to the main monuments in Granada and public transport. The price of the Granada Card Básico is €37 and the Granada Card Plus is €40. There is also a Kids Granada Card for children between the ages of three and eleven which costs €10.50.